A lance or spear tooth is an upper canine tooth that is mal-aligned and did not mature completely and commonly results in tooth-to-tooth contact. One or both upper canine teeth erupt in an abnormal position and become trapped behind the upper incisor. Contact between the lower canine tooth and this upper canine can be painful. If not treated, food and plaque may develop under the gum of these upper canine teeth resulting in pain, gum infection and bone loss. The tooth in correct position after treament. 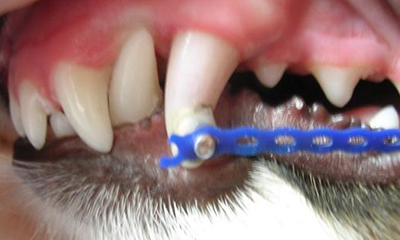 Schedule an appointment today to have your pet evaluated for any possible lance / spear teeth. This mal-alignment and incomplete eruption of an upper canine tooth results in painful tooth-to-tooth contact and gum infection if not treated. 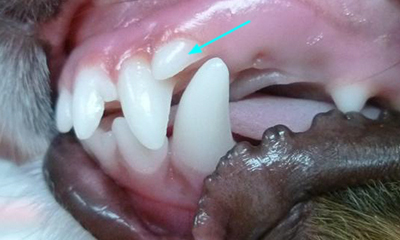 Lance teeth occur most commonly in Shetland Sheepdogs. 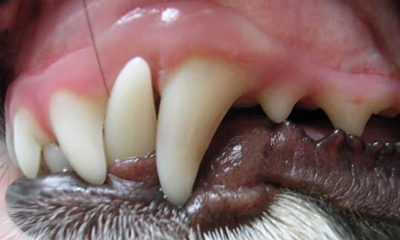 One or both upper canine teeth erupt in an abnormal orientation and become trapped behind the upper incisor. The lower canine tooth strikes this upper canine (painful) and may tip the tooth outward or inward resulting in lip contact or palate contact respectively. Moreover, when the upper canine fails to fully erupt, food and plaque will develop under the gum of these upper canine teeth resulting in pain, gum infection and bone loss. 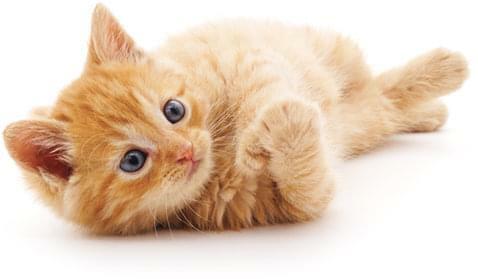 Depends on the severity of the condition and age of the patient. 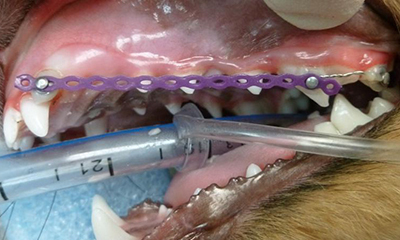 Many can be treated with orthodontic therapy (elastic chain) to tip the upper canine into a normal position. Others may need extraction therapy.